Anyone who has traveled with kids knows, that despite our best efforts, at some point those dreaded words will be said….I’m bored. Sure, you can log into Netflix, or you can beat the boredom blues with some of these outdoor games. This one will take a little prepwork, but how great would it be on a hot, summer day? Soak t-shirts in water, stick them in the freezer overnight, then the next day get playing! Whoever can put the frozen t-shirt on the quickest wins this race–although everyone wins with this fun way to cool off. Okay, this one is more eating than burning out energy, but it’s so much fun for kids. Although, be warned, it is a messy game so be prepared for some major cleanup afterwards. To play, cook up a pot of spaghetti and let it cool down. Then, mix candies into the bowl of pasta, and players have to find the hidden pieces of candy. The catch? They can’t use their hands. Before heading on your trip, buy some dinosaur toys from the dollar store–you may even find plastic dinosaur bones. While camping, bury the bones around your site and then unleash the kids on their own dinosaur dig. Just don’t forget where you’ve buried the bones, you don’t want the next campers to think they’ve uncovered a prehistoric site! Kids will love this take on a classic carnival games. 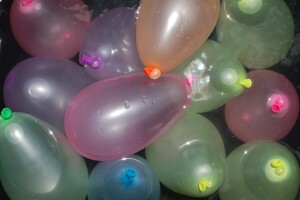 For this one, fill up some water balloons and then label different sized bowls with points–the largest bowl a higher number than the smallest. Then, line up the bowls and have kids toss the balloons into the bowls. Instead of handing out toys to the winners, offer then small rewards for their wins, like picking dinner one night or even just going first on the next game. Ready to head out on your next family adventure? Visit us today to see our newest arrivals! And stock up some t-shirts and dinosaur toys to keep the kids entertained for the journey.